What a week this last week has been. First the Royal Wedding and all of its amazing details. Next up, the Kentucky Derby. Both events steeped in traditions. I have loved looking back at all the fashion (and especially those fascinators! Do you think those will come stateside and pop up at some of our weddings?). The Kentucky Derby is also known for its fun fashion and crazy hats. The Derby also has quite a history with flowers and the presentation of the garland of roses to the winner. The roses were first established as part of the Derby celebration when they were presented to all the ladies attending a fashionable Louisville Derby party. 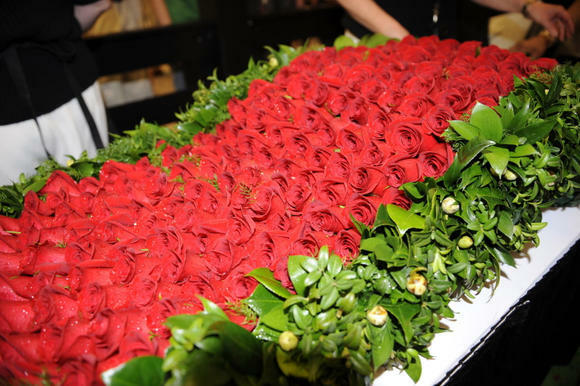 The roses were such a sensation, that the president of Churchill Downs adopted the rose as the race's official flower. The rose garland now synonymous with the Kentucky Derby first appeared in the 1896 when the winner, Ben Brush, received a floral arrangement of white and pink roses. In 1904 the red rose became the official flower of the Kentucky Derby. The tradition was strengthened when, in 1925, New York sports columnist Bill Corum, later the president of Churchill Downs, dubbed the Kentucky Derby the "Run for the Roses." The garland as it exists today was first introduced in 1932 for the 58th running won by Burgoo King. Each year, a garland of more than 400 red roses is sewn into a green satin backing with the seal of the Commonwealth on one end and the Twin Spires and number of the race’s current renewal on the other. Each garland is also adorned with a "crown" of roses, green fern and ribbon. 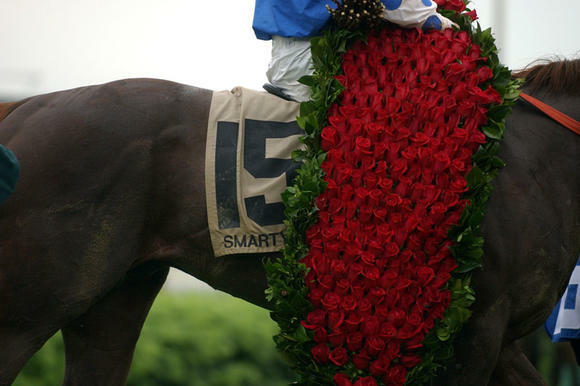 The "crown," a single rose pointing upward in the center of the garland, symbolizes the struggle and heart necessary to reach the Derby Winner’s Circle. We can't wait to see who gets presented the garland of roses this year. Good luck!